There were hundreds of plastic ones on the grounds of the Hospital where I had my surgery in Gainesville! As you may already know, October is Cancer Awareness month. So, it is appropriate for this to be shared right now. My absence from you was not by my choosing. Since 1988, I having been dealing with a well-known enemy, skin cancer, more accurately Melanoma. Three weeks ago I finally made the long trip to Gainesville for the appointment that I have avoided for three reasons, for the past fifteen years. Lack of money, health care and fear. All quite equal to my mind. In September with the last payment on our car, money could no longer be one of my excuses. So, I found a plan and a Doctor and made the too long put off appointment. I already knew I was in trouble before I ever walked through their doors. They took four biopsies and sent me home to wait for the call. It came exactly one week later. No matter how much you prepare, you are never really ready for that call. I had four cancers, one level three Melanoma, two other lesser ones and a Basal Cell Carcinoma. The kind person on the phone said that the level three would be done first with a wide excision in surgery. The Surgeons office called an hour later and I went the next day for a consultation. The Surgery and Sentinel Node removal were set for the next day. There was no time to prepare, just go. The most terrifying part, other than obviously the surgery, was a procedure new to me, a radioactive injection. The Surgeon and I had thoroughly discussed this and I reluctantly agreed to have it all done. With my first Melanoma in 1988, I had refused to allow my Lymph Nodes to be removed, which really angered the surgeon. The hideous scar and extensive cut he did, left me thinking that agreeing this time to a single excision of a Sentinel Node might avoid a repeat of the first surgery that left me feeling and looking, like the bride of Frankenstein. That scar went from my elbow nearly to my shoulder, a fact that really made my soon to be Doctor, the Chief of Dermatology at Kaiser in LA and new best friend, very angry. As he said, and I concurred, if the Melanoma has reached the nodes, you’re dead anyway, so leave them to do what they were meant to do. Over the next 12 years, there were 8 more Melanomas and 22 other moles removed. But, back to the Radioactive Injection. Knowing nothing about this was the worst part. It sounded simply terrifying and dangerous and scared the hell out of me. I got to the lab and every single person involved could not have been sweeter. When it was over, they all looked a bit surprised at how well I had done. They claimed I had handled it great. I told them that this was a piece of cake, the four biopsies had hurt a lot more. Ok that was done, then they took me to pre-op and did the usual things to prepare for surgery. I kept looking at my arm and the monster that had been a part of my life for more than twenty years and absolutely dreaded what was to come. Again the entire team was kind, gentle, understanding and made me feel good. When I woke up, I remembered little. After a brief tine in recovery, we were sent home. My Surgeon came to chek on me after the operation and said that he had taken a sentinel node and would not know if the Cancer had spread unitl it went to the lab. He would call me on Tuesday to let me know the results. So, we went back to the Hotel that we had checked into for a couple of days to get through it all. We stayed two nights and came home. The thing about Melanoma is this, if it gets to your Lymph System, it is pumping the Cancer out to your entire body. Unlike other Cancers, once Melanoma reaches the Lymph System is entirely fatal, there is no treatment, you are all done. And as for that new drug I wrote about a short time ago, I was told by the Nurse who did my 4 Biopsies, that it is just an extender, it simply just gives the patient a few extra months. At this time, there is not a cure, or a drug for level five, or Systemic Melanoma. So, finally on Tuesday at 1:30 in the afternoon, the call from my Surgeon came. I held my breath, waiting to hear the words I was afraid to hear. Thank God, his calming, assuring, voice said it all instantly. It had not spread, I was clear, he could not have asked he said, for a better report. It was difficult to talk to him and answer his questions, emabarrassinlgy I was crying too hard. Now, in a few days, the stitches will come out from the operation and then the Derm Clinic Doctor will tend to the other 3 Cancers. First the two smaller Melanomas, and then the Basal, which will inlcude another new procedure, Mohs. When that is finished, finally I will become just another regular patient at the Derm Clinic with regular check ups and moles removed as they present. For the past three weeks I have been to hell and back. Now I want to get back to what gives me a reason for living, writing on these Blogs. My reason for writing all of this today, is for one singular purpose, to encourage any of you with moles to stay on top of them. Please, Do Not make the same stupid mistakes that I did. Waiting to make your final car payment could cost you your life. It could have cost me mine. Melanoma is not like other Cancers, it is a fast, vicious killer. The most important thing that you can do for yourself is to look at your entire body on a regular basis. Have your partner or a friend look at the places you can not see. Any mole that changes color, size or shape could be a Melanoma and it can and will kill you, if it is not removed. I was stupid, but you do not have to be. Get checked and get safe. The sun is not your friend and getting a tan can kill you. I have been given a reprieve. I am so very grateful and now want to get back to doing what truly inspires me. This entry was posted in Basal cell carcinoma, Biopsy, Cancer, Dermatologist, Lymph nodes, Melanoma, Mohs, October, Radioactive injection, Sentinel Node, Skin Cancer, Sun, Suntan, Surgery, Tan, Think Pink and tagged Basal Cell Carcinoma, Biopsy, Cancer, Dermatology, Lymph Nodes, Melanoma, Mohs, October, Radioactive injection, Sentinel Node, Skin Cancer, Sun, Sun tan, Surgery, Tan, Think Pink. Bookmark the permalink. Sending you healing wishes from my neck of the woods. Be gentle with your self and take time to heal. I have missed all of you so very much! We certainly have missed you too! to those who may not be aware of how very lethal it can be. I felt quite guilty writing this and whining. There are so many everywhere who are in much worse shape than me. I am so lucky to know all of you and know that you have my back! You were all on my mind when I was going through this ordeal. We live in the Forest and seldom see people, so my Blogs have become my world and all of you are a huge part of that. So grateful to hear you are able to access the treatment you need and the good news that you are in the process of healing. Thank you so much Carol for your kind words and thoughts! My dearest!!! So good to hear from you …. and to know the good news!! Be blessed!! Thank you so very much Dear Dr. Rex for sharing this. It is extremely important to spread the word about this lethal killer. Yes, I am blessed to know each of you! How nice of you to come and share your thoughts. As we both know, the sun is NOT our friend. Best wishes to you, Donna, with hopes for a full and swift recovery. Thank you so much Jet. Am doing my best to do just that! Thank you so very much for sharing this vital health issue. And it is wonderful to be back!!!!!! You were all on my mind while I was dealing with this! Beautiful picture. Inspiring story. Thank you for sharing your courage and wisdom. Your good news makes me happy. Knowing all of you makes me extremely happy! Donna, I’m glad to hear you’re doing better. Keep on keeping on! I am doing much better now! You are one very lucky Lady! Ditto your advice to get checked – I get checked regularly because I was sunburned as a kid many times. I had a younger cousin that got a “pesky little mole” checked and 42 days later he was dead. So yes, get checked all over! I hope you continue to get yourself checked regularly and cancer does not return. Thank you Jackie for all the above! I intend to stay vigilant from this point on. I now have a great Derm Dr. and a great health Plan. They were all over the grounds at the Hospital in Gainesville. You’ve been through a huge amount of stress and misery here so I’m really glad to hear the results have ultimately been positive. It’s a good message you’re spreading too – people often leave these things until too late, partly through avoidance, sometimes due to financial issues, whatever the reason, the problem is unlikely to go away unless they take action as you have. Good health to you Donna from now on, I noticed your absence and welcome you back *smiles*. You were all on my mind and are a HUGE part of why I love writing on this Blog. An important message from Donna in regards to melanomas here, and one worth sharing I feel. It is a very dangerous thing to not know about. Actually I am the one who needs all of you and the planet. I can feel the love from all of you and it is making this so much easier to bear. Thank you. You are all so wonderful! Good luck and Godspeed, my husband had a melanoma removed last year and is just fine. Take care and blog more, I have been wondering where you were. Thank you so much for your kind concern. Melanomas are something that need to be talked about, a lot! My mother, a freckled fair skinned redhead battled skin cancer for years and won. She died of natural causes. Keep fighting and fighting for those whose belief is that all Americans should have access to quality health care without breaking the bank. Thank you. Will do my best to kick this. My daughter is like your mother and because of my bad genes she has already had a melanoma. It is a Very scary thing. Great news and glad it has turned out to be the best new. If you live in Florida, like you and me, skin checks are essential. Yes living in a sunshine state like here and/or California, is bad for those with moles and fair skin. Am SOOOO happy to be back and to be here with all of you. What an ordeal, you are a very brave lady. I am so pleased for the good news. I send all my very best wishes to you for a healthy future. Take care. Thank you so very much. Your support has been a huge part of my recovery process. In admiration – this is never easy and i send you all the healing i can. and a gorgeous picture to brighten the day. I will take all of the good thoughts and healing you all can send. It is helping me a lot right now. We all need to think pink. I’m so sorry that you had to go through what you did. And, a good report! Ha. I had to have 2 Mohs surgeries on my nose in the Spring and Summer 2010. The only pain was the anesthesia injection into my nose both times. It was really bad. After that, not a drop of pain – well, only the pain of embarrassment from the bandages I needed to have prominently displayed. We are all suffering from the sun’s UV rays many years after the fact. Again, congratulations for finally taking care of yourself. You were very lucky! 🙂 And, welcome back. People need to know these things. The more that we talk, the more they will learn. My stiches come out in two days. Then, two more melanomas to get taken care of next and then the Mohs on my cheek. You are all on my mind everyday. I an grateful for each of you and your huge hearts right now. Dear Donna, so glad to hear you’re feeling better. I send you my best wishes. We need you here. And, I need to be here with all of you. You are all my family now! Glad to hear your report was a good one. Kids don’t realize how dangerous those sun tans can be in the future. This was very personal and in the past I likely NEVER would have made it so public. forced me to tell the entire story, the good, the bad and the ugly. Everyone needs to know about Melanoma. I must admit I terribly missed exchanging thoughts with all of you and it was my need to do that, that made me want to get back asap.! Best wishes, Donna. Some scary stuff you’ve been through! Glad you’re back! The support here is simply amazing. I’m glad you were one of the lucky ones who survived. My brother ignored a mole that had turned black, and when he finally went to the surgeon and had it removed, it was probably already too late. He went through Interferon treatment, but a few years later, the cancer had metastasized to his major organs. He died about a month after it was diagnosed. He was a month short of his 40th birthday. But the tragedy doesn’t end there. My mother never got over his death, became severely depressed, went through counseling, and died of a massive heart attack four years later. I was eaten up with anger for many years after that. Thank you so much for sharing this painful story of your family. This was a very personal experience and sharing it was not something that I wanted to do. But, as a former Nurse, I know that there are many who are completely unaware of melanomas and how fatal ignoring them can be. I wrote this in the hopes of saving lives. You have confirmed that my intentions were correct. 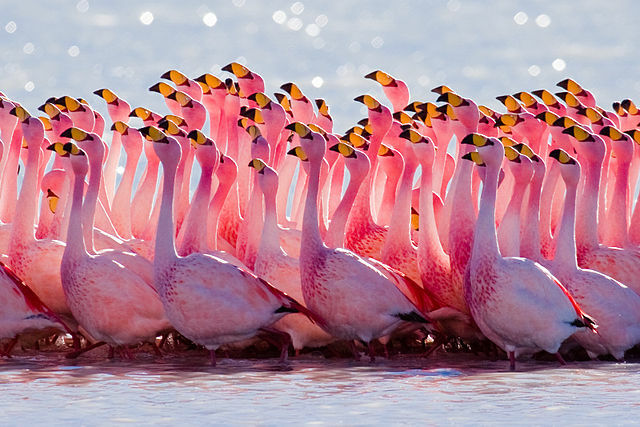 Think Pink!Absolutely,the beautiful, pink flamingos do justice to ur noble thought process,heal well n thanks for the info,my prayers are with u gorgeous! Thank you for these very kind words and thoughts!